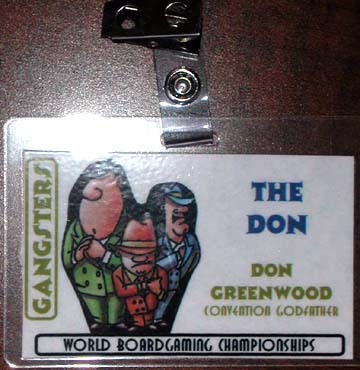 I'm pleased to report that Gangsters players were the wettest of all the gamers at the WBC. Gangsters remains #1 in the all-important boardgames-with-squirt-guns category (and, therefore, the most fun category as well). Not only that, but we continue our record, unbroken string as the gamers with the coolest names. Carnage and mayhem, along with dripping gangsters, were at their highest level ever. However, total losses were way down as vamps spent their time earning cash instead of batting their eyelashes in enemy joints! * High was set just last year! This year's attendance came very close to last year's record. Despite the slight decrease, an equal number of games were played! You can see all the stats, winners, hall of fame, strategy articles, etc. on the website (http://www.gameaholics.com/gangsters_tournament.htm). Pitt "Sluggo" Crandlemire's return (after a one-year hiatus) marked his return to Godfatherhood and the first time any gangster has won the title three times. Sluggo also has the distinction of being the only player to have reached the finals in every tournament he has ever entered (six times)! As for the GM and last year's winner, Sluggo's handiwork in our semi-final knocked me out of the top sixteen for the first time! Cement Overshoes Sportsmanship Award - Chaka "Patch-Eye" Benson probably feels like he's wearing the cement overshoes at the bottom of Lake Michigan! Chaka won his heat and came to the semi-finals to play. Due to a misunderstanding, however, Chaka didn't turn in a blue card and was over-looked as pairings were made and alternates called. Alternates, of course, are guaranteed their spots at the moment their name is called. Chaka took the bad news like a good sport and went and enjoyed another game. This contrasted so starkly with last year's alternate who wasn't present at the designated time when his name was called (or even when the games started) and flew into a rage that ultimately involved Don"The Don" Greenwood and other GMs that Chaka's sportsmanship was clearly this year's Cement Overshoes winner. Thanks, Chaka! Rolinda "Ma" Collinson, Josh "Music Man" Adelson, and Anthony "Trigger" Daw were also nominated for the first time. Nick "Slumlord"Smith received a second nomination. Many players noted on their cards that all of their opponents were really fun players who made the game great. Thanks to all of you - you make us look forward to a fun game with you next year! Junior Godfather Award - Andy "Scarface" Gardner learned how to play at the 2002 tournament and returned for a second game this year. He made it all the way to the finals and finished fourth. I hope Andy's skill inspires many of our first-time players from this year to try again next year! Honorable Mention - Instead of picking one player this year, I selected a game with many unusual characteristics! Kaarin "The Enforcer" Engelmann, Rob "Moneybags" Kilroy, Steve "The Knob" Zeinski, and Ashley"Angel" Collinson were the mobsters. 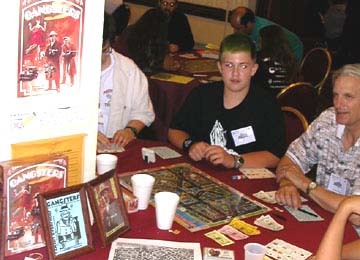 The game saw a 4 Thug eliminate a level 3 joint (a mere 7% chance), the most bloodshed of any game (with 20 gangsters going down as a result of enemy & police violence), the annihilation of Moneybags' entire gang (though he still ended with $8,600), a near purple monopoly (with the Racketeer in the final joint when the game ended), and Robocop (#10) mowing down the thugs left and right. Whew! I used my War at Sea Anti-Submarine Warfare table to calculate the odds of that Thug attack! Look for Gangsters on the deck of the Bismarck and Rodney next year! I also considered Peter "The Wolf" Martin and Mark "Ladykiller" Love for honorable mention since they were the only players to win with a monopoly this year (both red monopolies)! At this rate, will a sole monopolist get the honors next year? Rebecca Hebner was also considered for managing to pull Cop #4 from the cup seven times in a row despite vigorous mixing! Roadkill Award - The game with the most bloodshed (20 losses) also produced this year's roadkill, Rob "Moneybags" Kilroy, who was left holding the bag (with $8,600 in it) as his entire gang was wiped out (12 violence-related losses altogether). "I Think She Likes Me" Award - Despite the record low number of seductions this year, two players tied the record of last year's "winner" with six vamp-caused losses. After adding up all vampings, both were still tied. Ultimately, however, since the GM doesn't make the awards in order to give them to himself, he elected to break the tie in favor of Tim "Bite the Bullet" Evinger. Interestingly, Tim and John were each vamped six times in the same game - also the game with the most seductions over-all (17). Tim Evinger is the tournament expert on losing gang members - with a four year streak, winning the Roadkill award in 2000 and 2001 and the "I Think She Likes Me" award in 2002 and 2003. 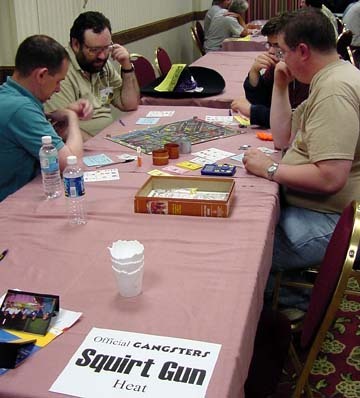 If you want a game where the squirt sub-machine gun gets used early and often, sit at Tim's table! The Downtown Bus Station continued its dominance among winner's joints - and even improved its percentage! Almost 30% of all winner's selected it as one of their starting establishments! Taylor's Machine Shop is the big loser this year - tying for 23rd despite its overall 9th place ranking and last year's number six standing! On the other hand, Huck's Marine and Cavalry Club were both frequently selected this year - and rarely selected in previous years by game winners! The purple strategies (Pussycat Club and Cavalry Club) are enjoying a resurgence. The Palace Chophouse continues to climb the charts as the favorite add-on joint! Sluggo played a traditional Bus Station strategy, which none of the other players had seen executed so efficiently. Both Vamp and Thug were able to extort continuously from the first turn onward. The Bus Station, on the other hand, took a while to payoff, but eventually both x1 public markers and the x2 headed that way - taking several bus rides including a $1,200 payoff on the final move that put Sluggo at exactly $10 G's. Sluggo's gang successfully hid out throughout the game - avoiding cops and rival gang members. The Infidel made a mad rush for joints with several $100 cheapies at the start and looked like a real threat for a 10 joint victory. However, the dice gods abandoned his Racketeer in the vicinity of Joe' Lanes - where his threat sputtered out. Scarface also piled up a number of small joints in the early going - cornering the market in the southeast corner of the board (including the Ham & Egg Kitchen which the others mistakenly allowed him to buy - still mentally in the five-player mode from the semi-finals). However, Scarface's Racketeer liked Ham & Eggs so much that he refused to leave - stopping Andy's real estate boom in its tracks. Band-Aid got hit by the boys in blue early - losing his Thug to a Cop shootout and Brizelli's Riverside to a raid. When the other players overlooked him for the next few turns, he quickly piled up three more blue joints - masterfully shooting up Brzkowsk's Imports and stealing it from Scarface in the process. On the next move, his Racketeer went to Taylor's Machine Shop - poised for a quick move to the last blue joint, Huff's Cafe (also owned by Scarface and, no doubt, protected by the same "forgot to duck" joint guards that had "defended" Brzkowski's). Only the public visiting the Downtown Bus Station kept Band-Aid from getting a shot at monopoly. Ultimately, while other players were busy replacing Vamps and Thugs as well as losing key joints to raids, Sluggo's immunity to the Cops proved the key to speeding his cash collection to victory ahead of those buying joints. Sluggo's win gives him an unprecedented third championship and a big boost to his team's chances in the team tournament! Everything ran so smoothly that there are only two changes for 2004. 1) The addition of special instructions for heat winners and top alternates to the back of the announcement sheet (which, among other things, will help ensure that there are no misunderstandings at the semi-finals). 2) At the fifteen minute warning, players will continue play until every player has had at least one additional turn AND all players have had the same number of turns. For this purpose a turn will be considered to have begun if the dice have been rolled. To accommodate the extra playing time after the fifteen minute warning, the fifteen minute warning will be given at 2:30 (just as it was in 2002 - but five minutes earlier than 2003). Ultimately, this should mean a fairer game and also give players a bit more playing time! Many thanks to my team of assistants for this end-of-round change! I've added the following statement to the first step of the shootout clarification: "Cops are controlled by the active player and act as a piece of his/her color [11.5, 12.4]"
9.4/9.7/11.5 What happens to a Cop which entered a building containing a criminal if the last criminal is seduced before a shootout can occur? A. The cop is returned to the cup (12.3). For all of the clarifications, see the website at http://www.gameaholics.com/gangsters_tournament.htm! PBeM competition heats up the streets of Chicago starting on October 1st. We'll be testing the new Wargame Processor module for Gangsters! (The module is free - as are the dozens of other game modules! The Wargame Processor allows 25 free trial saves - enough for a complete game - and then costs only $25 if you like it. Sign up today! See the website for details on how to play by email! A new BPA tournament will begin shortly after the new year (watch The Don's WBC newsletters for details)! It has been almost four years since I have seen a copy of Gangsters in a store. Fortunately, however, my operatives were able to locate a few new copies this past year. I have new, shrink-wrapped copies available for $45 (plus $7 shipping). Naturally, I prefer these copies to go to players without a game or those whose games are so worn that another is a necessity. However, I'm willing to put others on a waiting list. If you do find a copy somewhere that you don't buy for yourself, please let me know - I buy them to keep the tournament well-stocked! If you find one on E-Bay, let me know so that we don't bid against each other! I set my prices to earn a $5 profit per game - which I use on the special awards, name tags, timers, and other goodies for the tournament. I hope to have some bonus items at next year's tournament that will add to the fun and excitement. I won't say what I have in mind (just in case I go to Plan B) - you'll just have to show up and find out! See youse criminal masterminds on the streets of Baltimore next year! 4. If I could have a heat any time I wanted, I'd have it at _______ on _______.